As a presenter, you probably focus the bulk of your preparation on creating content, designing slides, and practicing talking points. When you get to presentation day, you’re ready to knock the presentation out of the park while you’re on stage. But are you prepared for your encore performance once the presentation ends? When you walk off stage, people will be waiting in line to talk to you, asking questions and wanting more information about your compelling call to action. For presenters who are extroverted, connecting with the audience and getting to know them personally can be the most exciting part of the event. However, for an introverted presenter, the idea of making small talk can be exhausting and overwhelming. There’s really no good way to eliminate small talk from the presentation space, and if you want to grow your platform and spread your message, you don’t want to forego this part of the presentation anyway. The good news is that by implementing a few easy tips, you can become a master of the art of small talk in no time! Tip 1 | Ask open-ended questions. Open-ended questions are essentially questions that are not answered with a simple yes or no. By asking open-ended questions, you invite your audience to speak first and create a fluid conversation. This allows the audience member an opportunity to share their perspective to you and potentially even add value to your existing message. Using this strategy also takes some pressure off of you to keep your side of the conversation from feeling awkward or rehearsed. Tip 2 | Listen closely. The art of listening is a challenging one. It’s easy to ask questions without slowing down long enough to listen to the other person’s answers or to be thinking about the next thing you’ll say rather than hearing what the other person just shared. Make sure you focus on a conversation with your audience as much as you focus on your presentation. Listen to the answers you’re receiving, and use the information you gather from those answers to ask more open-ended questions and keep the conversation going. Tip 3 | Have an exit strategy. Sometimes, you need to wrap up a conversation to get to another engagement on time or to move on to a different segment of the event. You might find yourself in a situation where an audience member inadvertently monopolizes your time. In this kind of scenario, you need a way to close the conversation without alienating the other person. Some presenters have a person waiting nearby to help you break off the conversation; others rely on noting unfortunate time restrictions to get out of these sticky situations. Whatever you choose, make sure to plan ahead so that you’re not caught off guard. Waiting for the moment to pop up can result in an uncomfortable situation very quickly. Small talk can be overwhelming and, at times, downright awkward. But it doesn’t have to be. 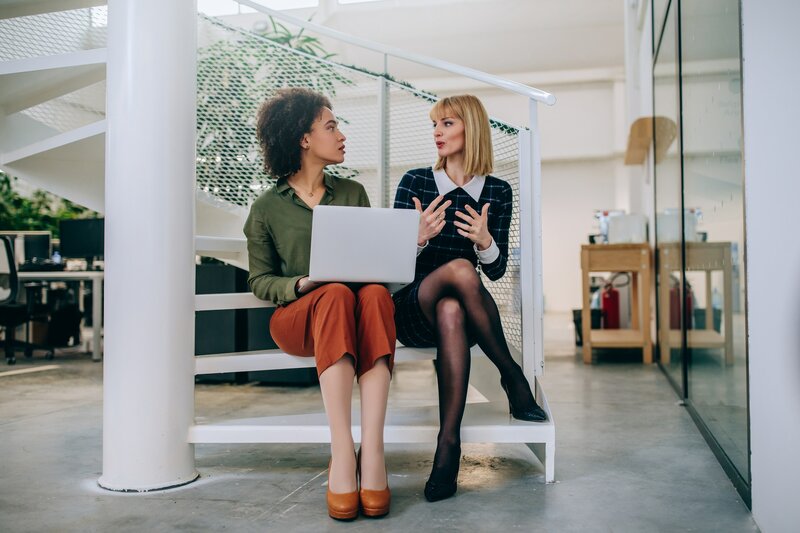 As a presenter, learning to leverage small-talk moments is an opportunity to spread your message further by getting to know your audience and connecting with them on a deeper level. The best presenters do much more than speak at their audience; instead, they speak with their audience. Looking for more tips on how to elevate your presentation game? Contact the team at Ethos3 today to find out more about our training opportunities.